Q. Do you have popular books to read for entertainment? 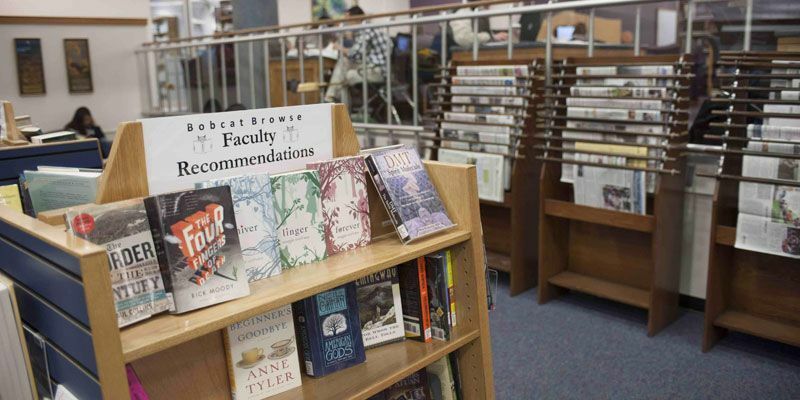 Bobcat Browse on the 1st floor of the library, just past Brewed Awakening is a great first stop to find a new favorite. This collection is made up of popular reading suggestions from faculty, staff, and students. Books in this area are shelved by Call Number. If you can't find the book you want, ask for help at the Service Desk. This area also has several racks holding the latest issues of popular magazines and newspapers. We have lots of books, comics, and movies in our main collection as well that are great for entertainment and self-enrichment. The literature section is on the 3rd floor, starting at PN. We can also help you find a good book in the main collection if you have any trouble. Just ask!